Young professionals and medical students from six countries (Paraguay, Ecuador, Colombia, Honduras, Peru and Mexico) received training at the Latin American and Caribbean Center for Health Sciences Information (BIREME/PAHO/WHO) on topics of scientific communication and access to scientific and technical information on health sciences. This activity took place in February, within the framework of the Center’s Biannual Work Plan 2018-2019, under the initiative Information and Knowledge Management. The medical students and recently graduated professionals are associated to the Federación Latinoamericana de Sociedades Científicas de Estudiantes de Medicina (FELSOCEM – Latin American Federation of Scientific Societies of Medical Students), a non-profit, scientific organization, dedicated to developing scientific research in the graduate courses of Latin American Faculties of Medicine, through improvements in quality and through the scientific level of the research undertaken, among other activities. The Director of BIREME, Dr. Diego González, recently received a report about a replication of the scientific communication and access to scientific and technical health science information courses. 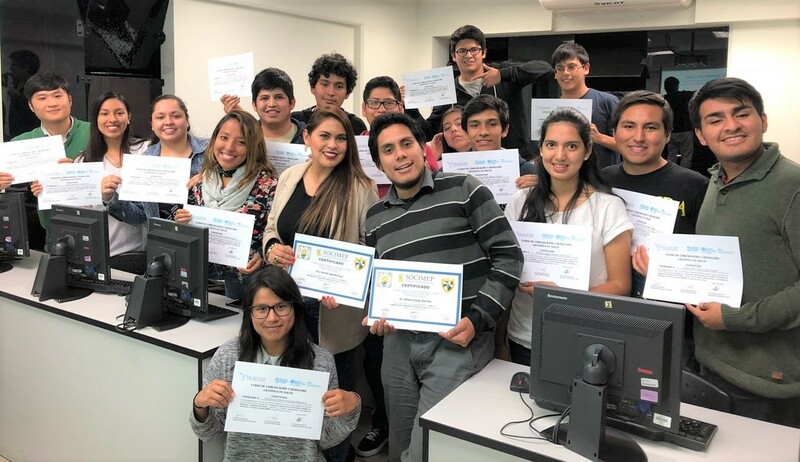 The workshops were given to students of the Faculty of Human Medicine of the Universidad de San Martín de Porres, in Lima, Peru, during the month of May. Willy Araújo and Fiorella Inga were in charge of the training. Both of them participated in the courses given at BIREME and had access to the course material produced by Ms. Verônica Abdala, (Services and Information Sources Manager), Dr. Lilian Calò (Scientific Communication Coordinator) and Ms. Rosemeire Rocha Pinto (User and Information Services Supervisor). According to Fiorella Inge, this activity occurred “in the framework of the collaboration between BIREME/PAHO/WHO and FELSOCEM and, in compliance with the commitments established with BIREME’s authorities, […] we have initiated a series of free replications of the course, with the objective of promoting communication and writing in the field of health sciences. We can, in this way, act as spokesmen and support the work carried out by the Center”. According to Dr. Diego González, Director of BIREME, “the alliance with FELSOCEM allows us to reach young medical students from Latin America and the Caribbean and the investment we made to train them here in BIREME is already showing results, the best example of which is this replication of the course on scientific communication and information access. We are working with the future decision-makers in the field of health”. As for the workshop on information access, working with recently graduated professionals is a strategy for promoting the culture of using the best evidence available when making decisions. In addition to avoid mistakes in the conduct of the health professional or manager, this optimizes the use of resources necessary for implementing the interventions. “The training for these young professionals and students was gratifying and effective, who after the training had the commitment to bring the knowledge and content they had learned to their colleagues, thus reaching many countries in the Region of Latin America”, stated Rosemeire Rocha.